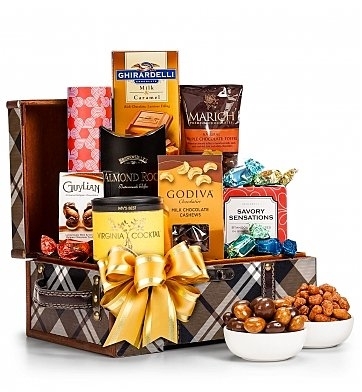 Ghirardelli and Godiva chocolates, Seattle Truffles, Brown & Haley's Almond Roca, Virginia Cocktail Peanuts, and fresh almonds are just a few of the prizes this deluxe collection offers. A stylish keepsake chest finished with a hand-tied satin ribbon features a distinctive dual handled design with sturdy brass rivets, solid wood construction, and a slender brass clasp. An impressive choice whatever the occasion. Brown & Haley's Almond Roca. Ghirardelli Milk Chocolate and Caramel. A keepsake chest designed for use again and again. Includes complimentary scissors to open packaging. Gift arrives decorated with a hand-tied satin ribbon. Measures 12" x 9" x 8".